I considered re-naming this post '50 Shades of Blue' . . . everyone seems to be loving the blues lately! Check out all of these amazing restyles done by some of my super talented customers! Anne restyled this vintage cabinet by painting it out, including the hardware AND stencilling the back panel - nice work Anne! 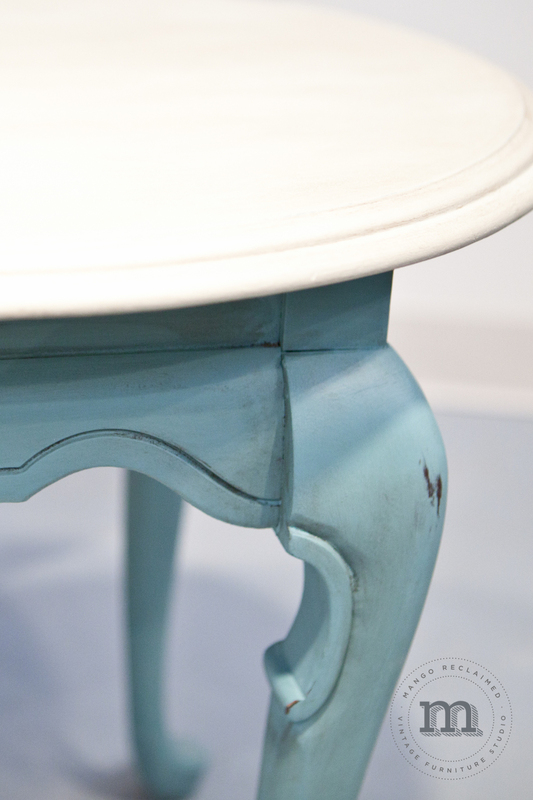 Laura has been loving a softer blue and used it to transform both of these console tables - beautifully done! 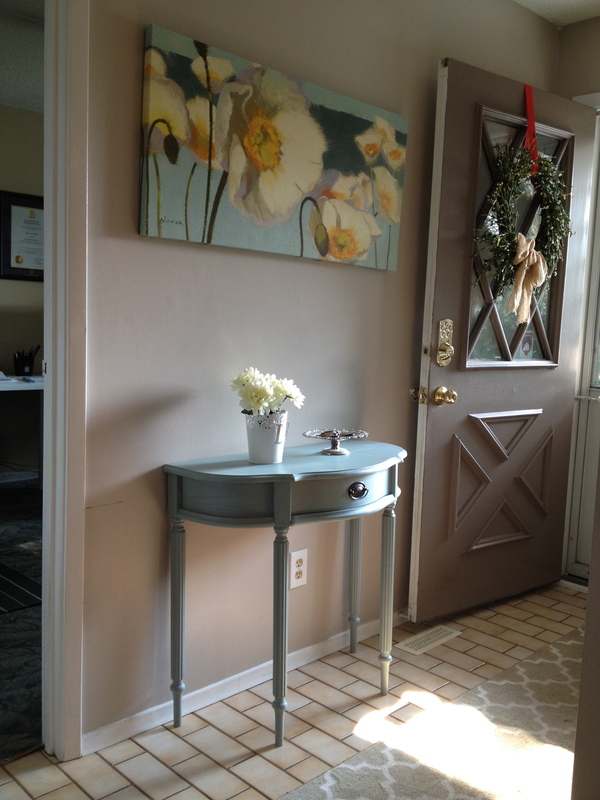 Just like Anne, Tonya also used a combination of soft blue and a soft white to transform her hutch and side table. Good bye dark hutch and dark green table - hello soft and lovely furniture! Great job Tonya! Custom Restyles and a couple of Trade Shows. Hello! I hope you have had an excellent weekend! Can you believe we are still getting snow? Seriously, I am done with all of this cold weather! Luckily I have some beautiful windows to let the sunshine in at the studio. Feeling the warmth of the sun can be therapeutic - and I just love a bright blue sky! Speaking of therapeutic blues, aren't these soft blues and cream colours fresh and inspiring? These restyles were all recently done using van Gogh fossil paint in some of my favourite colours . . . 'Patina', 'Morning Mist', 'River Tides', 'Chalk' & 'Cashmere'. Sometimes replacing some of the hardware and painting out the rest is a great (and economical) option. All of these pieces have a perfectly distressed finish and an all natural beeswax protective finish. If blues aren't quite your thing, how about these super girly girl pieces? A beautiful high 'girl' dresser, a sweet girls desk and matching chair. Recently completed for different customers, I think there are going to be some happy little girls when these get home! I LOVE the crystal knobs on the dresser and the light distressing on the chair. Some great books on that desk too - perhaps it's the desk of a future interior designer! Do you have any furniture you would like custom restyled? If so, contact us. 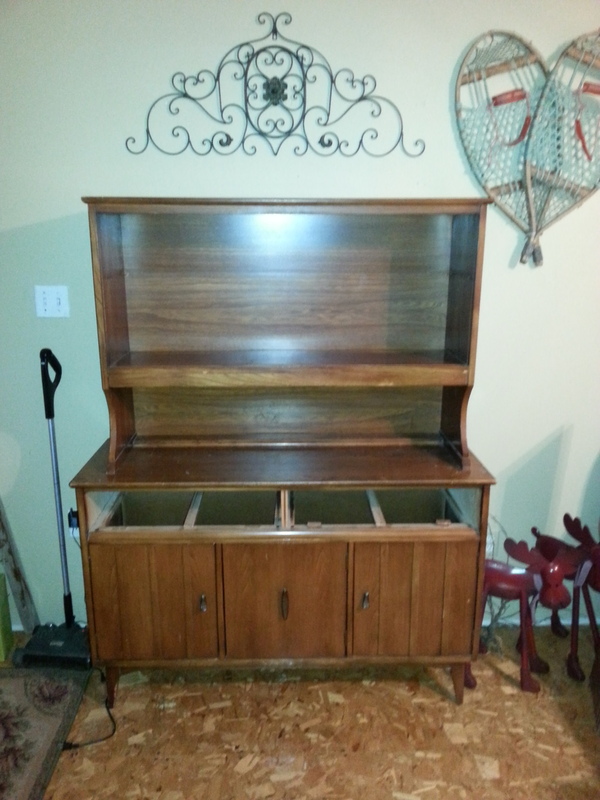 Want to restyle some furniture yourself? Check out our workshop schedule to learn how. As for trade shows - we have two different trade shows coming up. This wednesday the studio will be closed as Mango Reclaimed takes their style on the road to the attend the Local Biz Expo in Ajax (info below). We will also be attending the Home, Garden and Decor show March 28th/29th & 30th at Deer Creek in Ajax. At both shows, Mango Reclaimed will be sharing a booth with our super talented friend Leslie Appleton of 'The Inspiration Nest' - we hope to see you there!